A classic quality assault map 'back in the day' but now, a little long in the tooth in regards to today's standards. Any self-respecting UT99 assualt fan deserves a slap in the face if they haven't tried this one. It may not score as high today, as it would have back when it was released, but it's still a barrel of fun. The texture work in here is nicely done despite the challenges presented by the many slanted BSP brushes. As a result there are some misalignments, but they don't stand out badly. They are chosen well, and mix together to bring the gestalt together. The lighting is a bit of an issue, on the other hand. The first thing to mention would be the darkness. I certainly understand why its there, and why it's so prevalent throughout the map, and I certainly wouldn't want to play without it, but the profound depth of it in various large areas outside needs a little brightening. When playing with bots on a high difficulty level, the dark, as we all know, doesn't affect them the same as it affects human players and to be consistently sniped from far away when another human near you wouldn't even know you exist, can be a little frustrating. 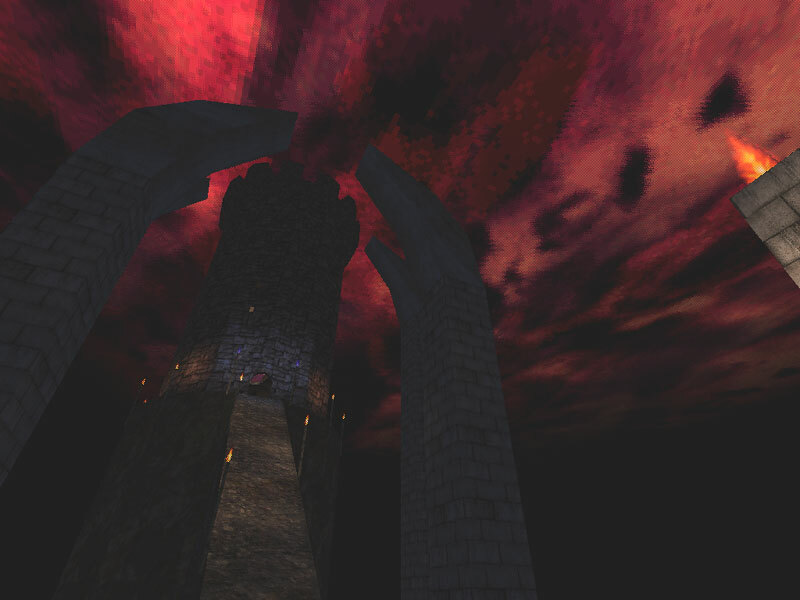 The other issue I have is the oversaturation of many of the lights inside the tower. Deep greens, purple, and reds, didn't ned to be quite so deep. The architecture of the map is the most striking, especially when spawning as the attackers. The height of the massive gates, the tower shooting up into the sky beyond them, the long, steep, high ramp one must climb - it's all very dramatic. Add the verticallity of the mausoleums, and it's all a great sight to see. The architecture fails, however, in the tower itself. It's suddenly blocky, thin wood walls that don't make sense, and little decoration. It's almost as if two different mappers created the outside, and the tower interior. It's really a shame more love wasn't put inside the tower. In general, the map is a visual treat but not without its flaws. The architecture is the most inspiring piece of the map, but the darkness it yet another opponent on the opposite team that you'll need to fight through. Despite a fair amount of BSP unaligned, I couldn't find an HOM. The BSP work is good and complicated, with nicely worked angles and slopes on the BSP terrain. The movers, triggers, and teleporters all work exactly as they should. The botpathing is good as well. I really only have two complaints. First, is that the map could have been zoned better - the tower in particular. Second, the soundscape is a little lacking. It's better than most, with nice ambient sounds and locational sounds, and the assult goal movers provide some triggered sounds. But not all the locational sounds were consistent - for example most torches and fires have a flame sound, but some do not. And some more triggered sounds would have been a nice touch to round out the theme. In sum, a pretty quality build. Some minor demerits for zoning, BSP misalignment, and slightly dissappointing soundscaping. 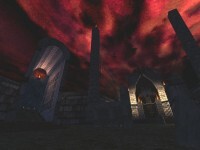 The idea is to storm the tower and release the evil 'god' imprisoned within. Along the way the defenders are provided with adequate supplies, and thank god sniper rifles are provided to them when trying to pass the first gate. The games in general are short to 'middlin' as the defense points don't have many good ways to travel 'up and down' due to their verticallity. And when fighting in the tower, it's basically a series of ambushes until you get to the top where it becomes a spam can. Bots, unfortunately do not police the lower and middle tower areas well, so you'll find the resistence largely at the final location. There is a 'sneaky' back route up to the top of the tower where an attacker can then teleport down into the final location, but again, all the bots are here anyways so it's almost a redundant route unless playing against humans. The darkness is a bit of a pain throughout the exterior portions of the map. It's difficult to impossible to see your oponents except in certain places which always gives the advantage to the bots. Also, when fighting around the final ascending ramp, it's almost impossible to tell where the land ends and the drop begins. It would be a decent challenge for the area if it was at least barely visible. Defending or attacking, the gameplay is fun. Sometimes the darkness or the vertically may upset you, and the tower interior may be a bit of a let down, but the rest is good solid fun. 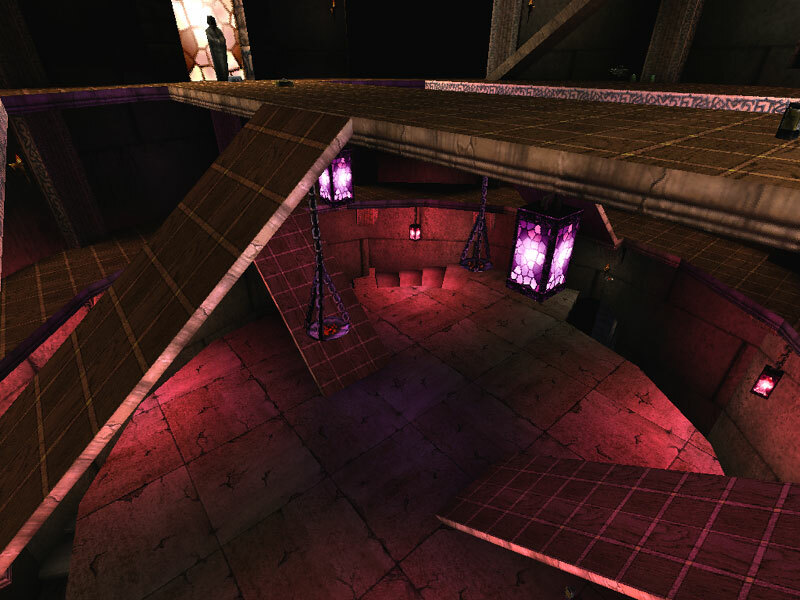 Overall a classic UT99 assault map - not necessarily rivaling the highest quality out there, but the setting and gameplay are what will keep you coming back despite its flaws. nice work! assault team spawnpoint in the graveyard looks very cool, and a little bit creepy. very dark lighted. from the starting point you see the huge tower you have to storm, protected by two huge gates. defenders can very easily run onto the gates. good sniper position. but as attacker you find a lot of cover. you can hide behind the gravestones, and the fact that you also have a sniper, and the defender's sniper position is very open (he can't hide) makes it very fair. 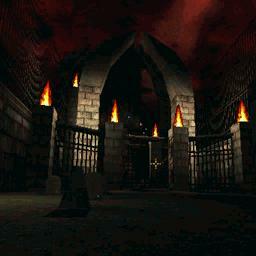 when the two gates are opened, you see a huuuuge ramp before you,leading to the tower's entrance. that is the part i mostly liked. running up the ramp, evading rockets...very much action in this part. unfortunately at this point you've already seen the most exciting parts of the map. the tower is a little bit boring. 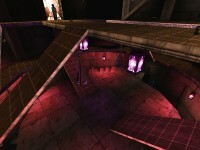 you try to reach the upper chamber, using ramps and teleporters. textures are mostly brown base-textures with mostly no architecture. but when you reach the upper chamber the optics get better. a round room with great statues. to reach the last objective you have to shoot into their faces (quite cool idea). shooting them will cause their eyes to glow, which looks very cool. when every statue is activated, you see a cool ending scene, where the entire floor begins to glow. despite the travel up to the upper chamber, the map is very cool. botpathing works and the lighting is very atmospheric...little bit creepy. A very nice awesome AS map. The starting point(where the attackers first spawn) is a bit dark though. For me, execution of events in the map suites it well. The only problem would be navigating through the tower. It took me 5 matches to realize the confusing lay-out. No rating, because you can't compared how good it was when released, and how good it is NOW. Ah, good old resurection. Good map. That button for the first objective was a little too hard to hit; but other than that it was a good map. I really enjoyed this map when i played UT classic. it was nice and dificult at times, an i never had any FPS problems with it.